Dana hand-feeds one of the flamingo chicks. We arrived in Kimberley, South Africa on Tuesday, March 12, after a long journey from Dallas. We were greeted by our fellow AZA colleague, who’s been taking care of the flamingo chicks for the last few weeks. 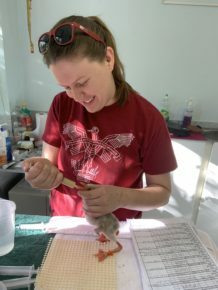 We were immediately taken to the Kimberley SPCA, where the chicks are being cared for, to jump in and quickly learn the ropes. The SPCA has the youngest of the 1,800 chicks rescued from the Kamfers Dam. All of the chicks are doing well! The first group of older chicks were brought in from the initial rescue. This group is already feeding themselves and, because of the specially formulated food they’ve been eating, they are starting to turn a bright pink/red a little bit earlier than normal. We are continuing to weigh these chicks every few days to make sure that they are continuing to gain weight and are staying healthy. Nathan weighs a flamingo chick. The second set of chicks came from a later trip to the Kamfers Dam. After the initial rescue, dogs disturbed the flamingo colony remaining at the dam and caused more flamingos to abandon their nests. Volunteers went in and collected the abandoned eggs, and now there is a group of 18 chicks. These chicks are still being hand-fed three times a day at 8 a.m., 4 p.m. and 10 p.m. Every morning the chicks are weighed so we can determine how much food to feed them for the day. We also make sure the little chicks get plenty of time outside for some all-important sunshine and exercise. On Thursday we got a chance to go out to Kamfers Dam and see the flamingos that are still there. There is still a large colony of adults raising an estimated 5,000 chicks. They are being monitored but continue to do well. Baby gorilla playdates will be endless this year at the Dallas Zoo! We are welcoming our second baby gorilla born in 21 years – and the second born in just the last year. A close-up of Megan’s baby./Senior Zoologist Annie B. Our 13-year-old critically endangered western lowland gorilla Megan quietly delivered the infant in the early morning on Thursday, March 7. This is Megan’s first time raising a baby and both are doing well; Megan has been very attentive, and the baby is nursing often and is keeping a strong grip on mom. 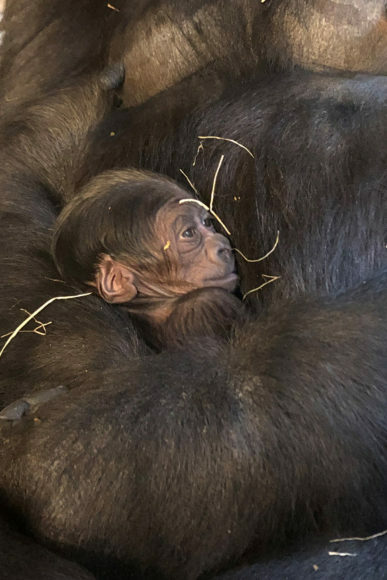 This birth brings another new wave of excitement for the Dallas Zoo – this is the first time we’ve cared for two baby gorillas at the same time in almost 50 years. 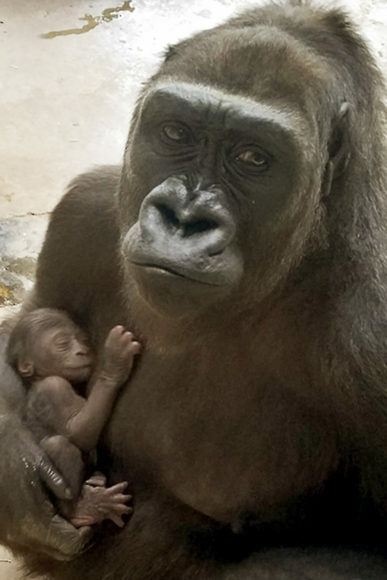 Nearly nine-month-old gorilla Saambili (born June 25, 2018 to mom Hope) now has a half-sibling playmate, and she’s already shown much interest in the newest addition. Mom Megan was paired with silverback Subira (also the father to Saambili) on an Association of Zoos and Aquariums’ (AZA) Species Survival Plan breeding recommendation in hopes of increasing the western lowland gorilla population in North America. Subira has proven to be an excellent father to Saambili, and he’s recently been observed giving her special attention and playtime during this quiet period for the troop. Megan holds her sleeping baby./Lead Zoologist Tara S.
The Dallas Zoo cares for ten gorillas, including the bachelor troop who live on the south side of the Gorilla Trail, and the family troop who live on the north side. All six family troop members have remained behind the scenes so Megan and her baby can bond privately. Zoologists will take their cues from Megan on her comfort level and readiness to explore the habitat. A moniker and the baby’s gender reveal will come within the coming weeks. According to the Dian Fossey Gorilla Fund International, there are approximately 350,000 western lowland gorillas left in Africa. The population decline is contributed to habitat destruction, poaching for bush meat, animal trafficking, and disease. With nearly 300 western lowland gorillas living in AZA-accredited zoos, the nation’s top zoos have never been more committed to protecting this species in human care and in their native habitat. The Dallas Zoo has supported gorilla conservation for many years through its partners at the Dian Fossey Gorilla Fund and the Gorilla Rehabilitation and Conservation Education Center (GRACE). Our animal care team aims for Megan and her baby to make their first scheduled public appearance by the end of the week (weather dependent). We will share the date on our social media channels! In the early 1900s, an estimated 3-5 million elephants thrived across a vast range in Africa. Today, there are only about 415,000 African elephants remaining in the wild, and their range has been reduced by nearly half. They have suffered from massive amounts of poaching for their highly prized ivory tusks. The demand for ivory was so steep that in 1989, an international trading ban was put into place. However, illegal poaching persists and results in the deaths of approximately 96 elephants every single day. If current trends continue, it is entirely possible that they will be extinct in our lifetime, which is why we are on a mission to support elephants in the wild. This week, the Dallas Zoo has set a goal to raise $10,000 through grassroots fundraising to support conservation efforts in the wild. Read on to learn more about these amazing animals and what you can do at the Dallas Zoo to help! The Dallas Zoo’s award-winning Giants of the Savanna habitat is home to 8 magnificent African elephants. The “Golden Girls:” Jenny (42), Gypsy (37), Congo (41), Kamba (39) and the Swazis: Tendaji (approx. 15), Mlilo (approx. 15), Zola (approx. 15) and baby Ajabu (2). 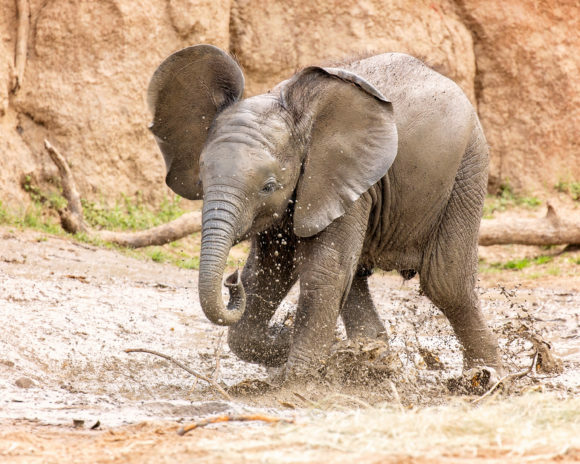 Baby Ajabu plays in a mud wallow. The design of the Giants of the Savanna habitat was based on field research and allows our elephants to be more active as they look for food, water, and companionship, just as they would in the wild. Treats are occasionally hidden in trees or in niches around the habitat, and elephants exercise their trunk muscles to find those treats or to reach high-hanging hay nets. They travel over small hills, into waterholes, and along an off-exhibit pathway for additional workouts. 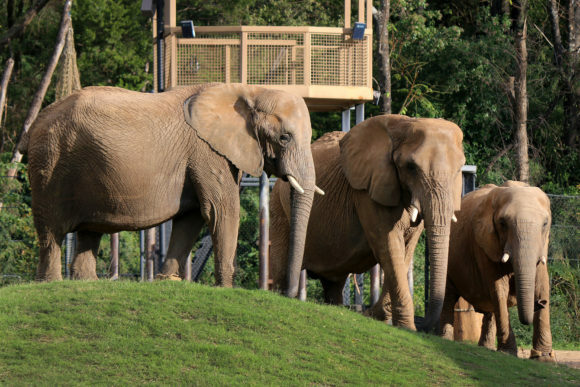 The Dallas Zoo elephants also have the luxury of their behind-the-scenes barn. The innovative barn is optimized for climate control – with radiant floor heating and padding in the winter months and movable walls that provide cross-ventilation in the summer heat. This barn also has a community room with 7-foot-deep sand floors used to bury food and toys, since the elephants are accomplished diggers. Elephants are well-known for their intelligence, close family ties and social complexity, and their capacity to remember other individuals and places for years. Elephants have strong, individual personalities that affect how they interact with other elephants and how others perceive them. An example of this at the Dallas Zoo can be seen among the Golden Girls. Jenny, our oldest resident, is vocal and playful. Gypsy is mischievous, eager, and loves attention. Congo is inquisitive and enjoys exploring. Lastly, Kamba is friendly and cautious and enjoys being around the other elephants. The position of head of the family is held by a female known as the “matriarch.” Matriarchs express their dominance in both competitive and cooperative situations. The most successful leaders seem to be confident individuals who are able to command the respect of others through both their wisdom and their charisma. An elephant herd consists of one or more (usually related) adult females and their immature offspring who feed, rest, move, and interact in a coordinated manner and are closely bonded. Members of a family show extraordinary teamwork and are highly cooperative in group defense, resource acquisition, offspring care, and decision-making. Since January 2019, a group of dedicated conservation interns has been learning all about African elephants – through interviews with keepers, behind-the-scenes tours, and tons of research. It all culminates in this special Conservation Week (March 9-16), when we will be engaging Dallas Zoo guests to promote awareness about elephants and inspire conservation action. This is an exciting time for us, as we get to show our months of hard work and dedication to the conservation of elephants. We have also worked countless hours ensuring that we are getting different departments of the zoo engaged and excited for the upcoming week of fun, information, and memorable experiences. The BIGGEST way you can help elephants is to NEVER purchase ivory or anything made from parts of elephants. Also share this information with others around you so that you can help spread awareness and begin the cycle of change. A group of Dallas Zoo interns, including myself, have organized a jammed-packed week full of fun events and conservation engagement. We hope you join us at the Dallas Zoo during Swing Break through March 17 to help us create a better world for animals. $10,000 for elephant conservation – Help us reach this goal by purchasing elephant swag from us at our Campaign Station in the Zoo, or by attending any of the events during Swing Break. 2,500 personal pledges – Stop by our Saving Elephants Campaign Station to take a pledge for pro-wildlife behaviors that benefit elephants. Please support our efforts of raising funds for elephants so we can continue making a positive impact for the lives of the most majestic mammals. Penguins on Bird Island investigating my camera. 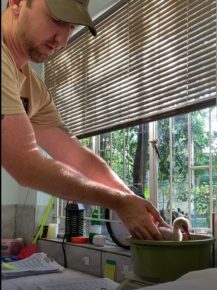 Animal Care Supervisor of Birds and the Artificial Nest Development Project Coordinator for the Association of Zoos and Aquariums (AZA), Kevin Graham, guest blogs on ZooHoo! The artificial nests destined for this round of installation on Bird Island had arrived the day before, or at least most of them had. As is often the case, the reality of a situation doesn’t always match up with the plan that was put into place. The group arrived at the “helipad,” a flat clearing in the middle of the massive sand dunes that’s used to land the helicopter and sling equipment over to the island. The artificial nest team members met the Addo SANParks Section Ranger, the island Colony Manager and a team of marine rangers and other local staff for a rules briefing. Bird Island is a destination that very few people have the opportunity to visit – it’s not accessible to the public at any time, and in normal circumstances the only people lucky enough to spend time on it are either rangers or field researchers that have received authorization. Our strong working relationship with Addo SANParks over the years allowed the nest project to do something that is extremely rare – bring a large team of non-locals to the island to work. The team boards a helicopter to travel to the remote Bird Island. With all of the gear, supplies and equipment ready, we had nothing left to do but eagerly await the arrival of the helicopter. The pilot has worked closely with Addo SANParks for quite a long time and is extremely helpful with access to the island. The only ways to get to Bird Island are via helicopter or by a boat trip that can range from two to five hours each way, depending on water conditions. Several flights would be needed to transport the nests and the remaining supplies to the island, with the weight slung in a cargo net beneath the helicopter. The maximum weight capacity for the airlift on a calm day is only about 550 kilograms, the equivalent of 37 completed nests. We had 300 nests ready to be transported, in addition to the necessary supplies to survive four days on an island with little in the way of amenities. We estimated that we’d need approximately 10 trips across to carry all of the people, supplies, nests, and equipment. The forecasted calm weather gradually turned into high winds after a couple trips across the ocean, which caused excessive air turbulence. This meant that fewer nests moved per airlift. The wind also didn’t cooperate on the next couple of days, so the remaining nests weren’t able to be transported until Friday, Feb. 22. Unfortunately, this was the last day the artificial nest group was slated to be on the island. On the plus side, the Marine Ranger team from Addo SANParks was trained in the assembly method for the nests and are familiar with the process of placing the nests correctly. Members of the artificial nest team worked from early morning to the end of the day on any and every task that needed to be accomplished during our four-day stay on Bird Island. This included assembling the 35-pound artificial nests, carrying them into the colony from the boat house on the far end of the island, updating and maintaining the precision electronics used to monitor the nests, cleaning up marine debris, surveying for sick and/or injured birds, removing the older, ineffective nests from many years ago, GPS tagging of the new nests, and documenting the work. 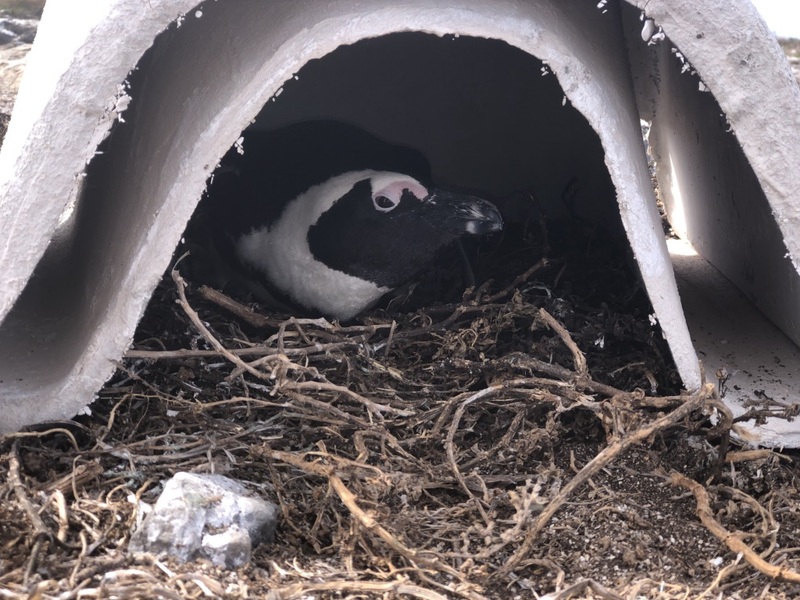 With the help of the dedicated Marine Ranger team from Addo SANParks, the nests were assembled and moved into place for the penguins to begin using. Since we had the equipment and knowledge, the nest team members also were able to work on the desalination plant for the island, which had been broken and unusable recently. A penguin quickly makes use of one of our artificial nests. In the long run, the four days of work went off mostly without a hitch, and everything that was intended to be finished was accomplished. And, if you’re wondering if all of this is worthwhile… within 24 hours of the new nests being put into place, the occupancy rate was already 57%. In a massive surprise to all of us, one overly ambitious hen even laid an egg in a new nest less than half a day after it was placed. The feeling of awe is overwhelming, watching her look for somewhere she could safely incubate her egg and potentially raise a chick. It’s even more so when we realize we’ll provide thousands of birds this same opportunity of safely raising their offspring during the course of the project. And on that note, we’ll be leaving Port Elizabeth to head to the Western Cape, where we’ll work in several more colonies. But first: a very long, very hot shower for us to wash about three inches of dirt away. 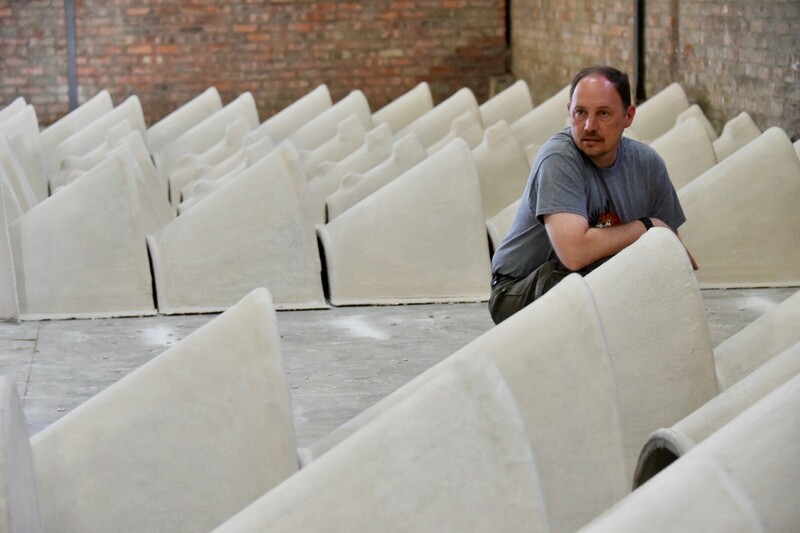 Kevin Graham examines the artificial nests at the nest manufacturing factory. Our time caring for the 1,800 rescued little stinky grey and fluffy birds (a.k.a. flamingos) came to an end yesterday, and we’ve moved on to the bigger stinky black and white birds (a.k.a African penguins). We’re about to depart on helicopter to Bird Island, where we’ll make about a half-dozen trips back and forth to the deserted island that will be our home for the next four days. This is where we’ll install hundreds of artificial nests for the penguins to safely lay their eggs in and rear their offspring. But first, we worked on an incredible side project today at the penguin nest manufacturing facility in Cape Saint Francis, South Africa. I was able to inspect the work being done, and talk with the folks who have been building the nests, since the manufacturing site opened up a little over a month ago. This site is being coordinated under the watchful eye of Trudi Malan of Dyer Island Conservation Trust. This location is currently home to many tons of raw materials that are being converted into penguin nests at a rate of about 20 nests per day. While this doesn’t sound like a lot, these nests are 100% made by hand and have a very specific formulation of products that has to be prepared and a significant amount of materials that have to be worked in the exact order in order to properly build the nests. The construction team builds the nests, which involves a very detailed process. 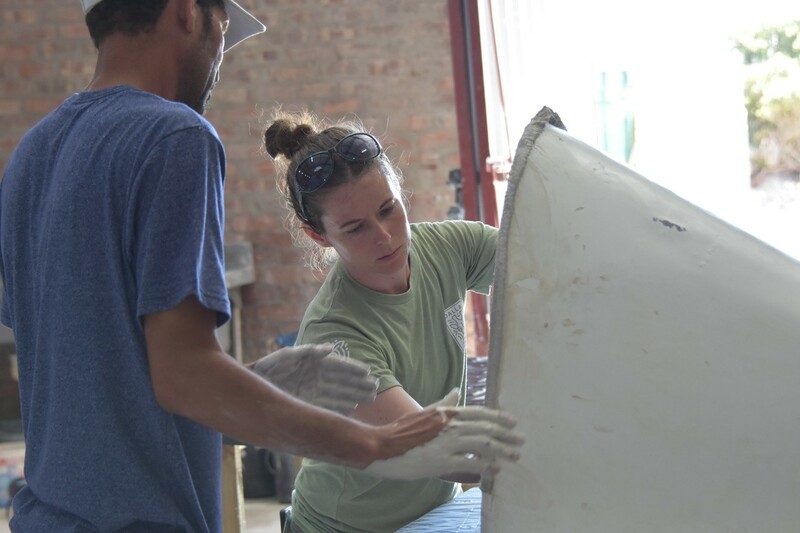 The team members that are building the nests have not only become very efficient and skilled at the process, they’ve also begun to understand that the project they are assisting with is destined to make an improvement in the lives of an endangered species. These team members have a strong and growing pride in the work that they are doing and it shows. For many of them, this job is helping them learn new skills and offers them financial assistance. But more than that, they see their role of building the nests as a part of a bigger picture that can potentially save the lives of birds that desperately need help. 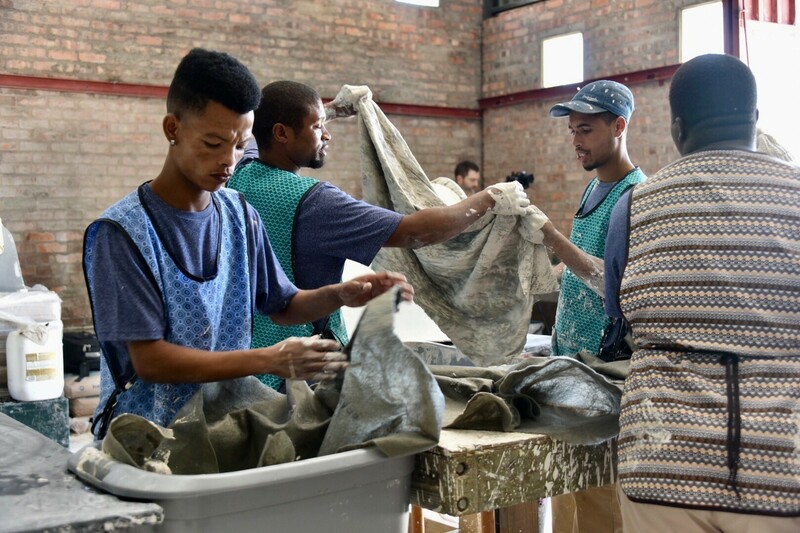 To construct the nests, they begin with preparing the Sealmac geotextile fabric cutouts, which will be used as the skeleton of the nest construction process. These individual pieces of geotextile fabric are then thoroughly impregnated in a ceramic slurry composed of a very specific ratio of several compounds. If the ratio of compounds is out of balance by even a small amount, the overall strength and integrity of the end product can be compromised. Each piece of the geotextile fabric is layered onto the mold in a very specific sequence, which builds up the integrity of the structure. Once the numerous pieces of slurry-filled fabric are all securely in place on the mold, they cure for at least 24 hours until any further work can be done. Dallas Zoo’s Senior Zoologist Julie Farrington also inspects the nests. The next day the finished nests are removed from the molds and moved into the drying area to allow these completed pieces to continue curing for at least another 48 hours. Any work that is attempted during this curing time would have a strong likelihood of causing damage to the nest structure that would be very difficult to repair. Once a period of 72 hours minimum has passed, the pattern for the ventilation holes in the nest is traced onto the nest structure, and the ventilation holes are drilled. This pattern has been designed to increase the thermal venting of the nest structure on hot days and is a critical component in the thermoregulation inside the nest. When looking at the end product of the nest, it doesn’t look like something that would be all that complicated, however there is a tremendous amount of science and research that went into the development of these penguin nests. Between the materials research; the design research; the multiple extensive rounds of testing; and finally the ongoing construction of the finished product that is beginning to be installed in colonies, this has been a very unique challenge. Recreating the perfection of Mother Nature is not an easy task, but thanks to the dedication of the nest project team consisting of members from Dyer Island Conservation Trust, Pan-African Association of Zoos and Aquaria, the Dallas Zoo/AZA SAFE, and especially those people and organizations that have believed enough in the potential of providing homes for endangered penguins, we are confident that we’ve come as close as possible. Really early tomorrow morning (which will be really late at night for you guys in the U.S.), we’ll be departing for Bird Island to begin installing the first of the finalized nests in the colony there. 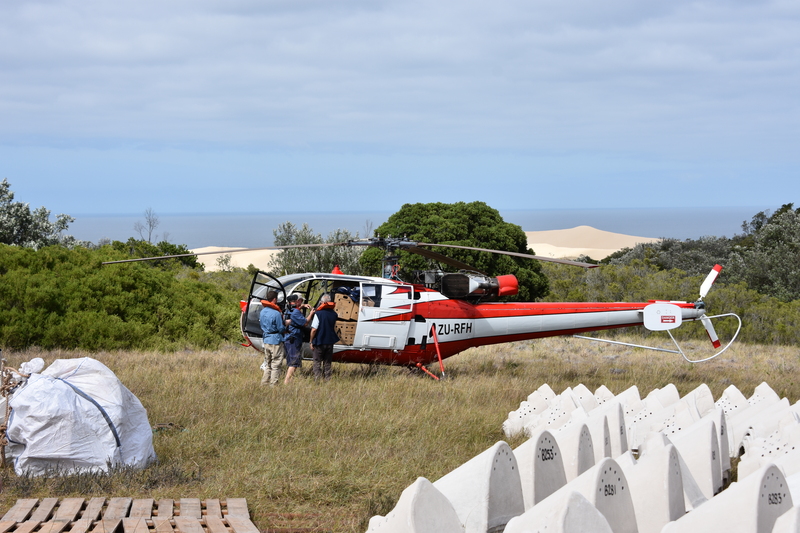 Thanks to the ongoing support and assistance of ADDO SANParks, we will be transporting the nests and supplies over to Bird Island by helicopter. This saves a huge amount of uncertainty in access to the island since it’s a two hour boat trip each way in calm waters or up to a five hour boat trip each way in rough waters, which usually ends up with a large number of the team members leaning over the edge and relieving themselves of their breakfast. More to come later, assuming we survive. 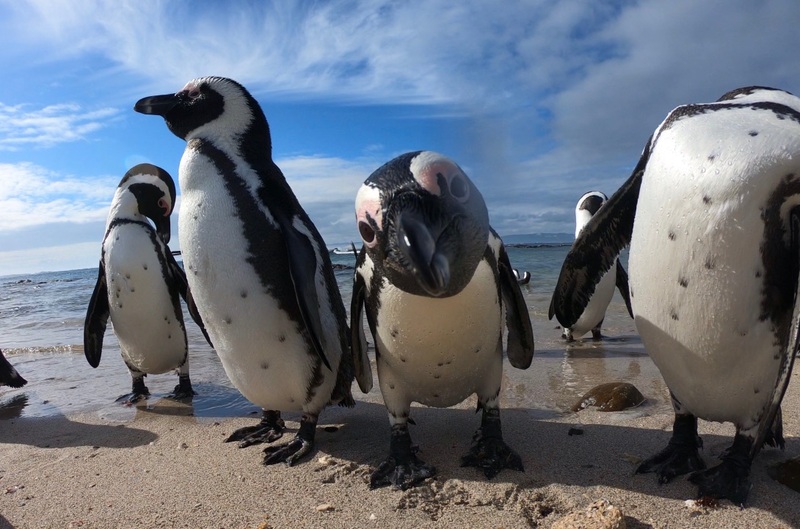 There’s a whole lot more in the way of photos and videos to come, so stay tuned as I continue to update you with field notes on this unprecedented project to save endangered African penguins.